Deviating from the age-old patriarchal traditions, daughters carried the body of their mother on shoulders and lit the funeral pyre here today. Ginno Devi, a septuagenarian, died at her Parmarth Colony residence here. She is survived by two daughters and a son. 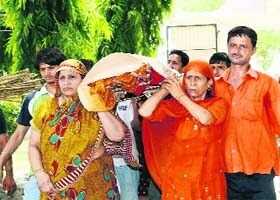 When her funeral procession started , the deceased’s daughters, Angoori Devi and Santosh Devi, and two daughters-in-law, Ramo Devi and Santosh Devi, carried the body on their shoulders. Ginno Devi was cremated at Shiv Puri here, where her daughters lit the funeral pyre. Ramesh Insan, a son of the deceased, said his family had followed the teachings of Dera Sacha Sauda, which considered women and men equal in all respects.